No woman is an island. So, occasionally I look to mix things up around here by trying out some recipes in a cookbook for inspiration. I looked around and found this book ‘Simply Vietnamese Cooking’ by Nancie McDermott, you Good Eats fans may remember her as the Cake Historian. A person who knows cake that well should be trusted. I’m pretty sure that’s a law. This particular book also grabbed my attention because I love Vietnamese food but lack a restaurant in this corner of the shire. I find Vietnamese food to be so different than say Thai or Chinese, so sadly those places just can’t fill that void. I need those bright, vibrant and refreshing flavours that come from their use of fresh and fragrant herbs. Oh, and we must not forget the oodles and oodles of noodle dishes! We always hear how healthy Asian cooking can be for us, so why aren’t we doing it more? Well, likely because you think (much like myself) that getting those authentic flavours is a complicated process or perhaps you are a little tired of just doing Chinese food. I put a few of the recipes in this book to a stress test. I was determined to make them after a late night of work. You know what? I succeeded. I had a bowl of tasty authentic flavoured Vietnamese cuisine in front of me within 15 minutes. I even had time to read the cute little “Vietnamese Tales” educational story included with many of the recipes. Really, most of the time was spent cutting and assembling. Vietnamese food assemble!! The best part, I used produce from my own garden. So many of the recipes in here include things that grow so very well in my garden such as cucumbers, mint, basil, green onions, chili peppers…to name a few. A wonderful way to enjoy the last tastes of your summer garden or even next year’s flavours. This recipe is a pattern for innumerable delicious variations on the meal-in-a-bowl known in Vietnam as bun. You can compose a go-to version using ready-to-savor ingredients, such as chunks of rotisserie chicken, slices of Char Shiu-Style Pork (page 88), roast duck from an Asian market or tender slices of grilled flank steak from yesterday’s grill-centered feast. Keep a couple of packages of dried rice noodles (or angel hair pasta) in your pantry, stay stocked up on fresh herbs and lettuces and mix up a jar of pickles (pages 128 to 131), and you’ll be set for pantry meals of irresistible deliciousness on a moment’s notice. 1. Bring a large saucepan, Dutch oven or pasta pot of water to a rolling boil over high heat. Drop in noodles, remove from heat and let stand, using tongs or a slotted spoon and a fork to separate the noodles and let them cook evenly, for 10 minutes. When noodles are tender, drain, rinse in cold water and drain again. You’ll have about 6 cups (1.5 L) of cooked noodles. Let stand while you prepare the remaining ingredients. 2. Set out 4 big Asian-style noodle or soup bowls. Divide ingredients evenly among the bowls: lettuce first, topped with 11⁄2 cups (375 mL) noodles in each bowl. 3. Place roast chicken on one side and cucumber, fresh herbs and any optional ingredients you’re using on the other. 4. Sprinkle green onions and peanuts over chicken, pour 1⁄4 cup (60 mL) of Everyday Dipping Sauce over each portion of the noodles and serve at once, inviting your guests to toss everything together as they begin to eat. These delicious mix-and-match main course noodle salads make an ideal buffet where each guest can choose their favorite ingredients in quantities they like. Set out the ingredients in the order guests will add them, with noodles first, along with tongs or two forks for easy serving. Next come meat, cucumbers, mint and bean sprouts; followed by pickled carrots, green onions and peanuts. Have the sauce in a bowl with a ladle or big spoon or a small pretty glass pitcher if you have one, so they can add the seasoning at the end. 2. Scrape paste into a small bowl and stir in fish sauce, water and lime juice. Stir well to dissolve sugar. Transfer to small serving bowls for dipping. Or cover and refrigerate for up to 1 week. Yummm! 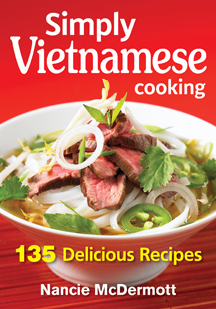 I’ll have to find this book 🙂 Until then, you’ve inspired me with this post to make pho, perfect for this rainy day!